3" Diaphragm Pump Details - Quasius Equipment, Inc.
Our 3" Diaphragm Pumps are an excellent choice for dewatering ditches or other work areas where silt or muddy water is present. Because there's no impeller shaft or seal, the abrasive action of the sand can't harm the pump. The rubber diaphragm moves up and down and the rubber flap valves keep the water going in the right direction. 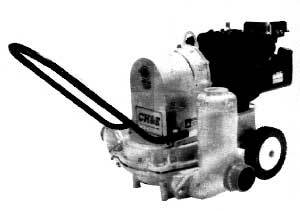 Diaphragm pumps are also self-priming and they can be run dry without damaging the pump. Then, when the water seeps back in again, it will just pick up where it left off and begin pumping without requiring any priming. Diaphragm pumps are positive displacement pumps, so care must be taken not to kink the discharge hose or otherwise restrict the flow, or else you'll have bursting hoses. Commonly called "Mud Hens," these pumps will be found on many construction sites pumping out ditches, foundations, or other muddy work areas. The only drawback to diaphragm pumps is that they are slower than an impeller-style pump. While 5,000 GPH isn't exactly small, if you have clear water pumping and lots of water to pump, our 3" Trash Pump may be a better option. Also, diaphragm pumps aren't designed to pump pure mud. The silt needs to be suspended in water so that it can be jetted through the system or else it will pack up the pump cavity or discharge hoses. All water pumps work on the principal of creating a vacuum in the suction hose and allowing atmospheric pressure to force the water into the suction hose and up to the impeller. This limits the suction hose length to 20', or else the atmospheric pressure wouldn't be enough to lift the water into the pump. Once the water hits the impeller, the engine's power can send it hundreds of feet if needed, so discharge hose length isn't a problem. Our 3" Diaphragm Pumps are rated at 5,000 GPH. The maximum head (vertical lift) of the discharge hose is rated at 25'. Twenty feet of suction hose is included with every pump. Discharge hose is available in various lengths and is rented separately.